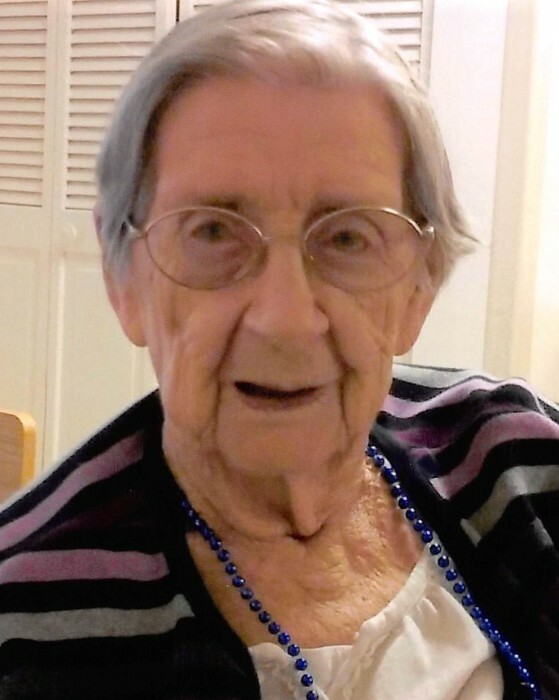 Mrs. Irene Shepherd Trimble Reeder passed away Thursday, March 28, 2019, at the Care Center at Kenton Pointe in Maysville. She was 102 years old. Born on August 19, 1916, she was the daughter of the late Chan Shepherd and Kate Wells Shepherd. Irene was blessed in many ways in her long life. She and her late husband, John Trimble, owned and operated a general store at Lewisburg, KY. She liked gardening and canning garden vegetables, and in past years, had helped with the farming adventure. She and her late husband, Tommy Reeder lived in Nepton. For the past four years, she had been a resident of the Pioneer Trace Nursing Home. Always anxious for a hug, Irene loved the people at the nursing home including the nurses and other residents. For her, the nursing home became her home away from home. She was member of the Antioch Church of Christ. Irene is survived by three children, her son, Shelby C. Trimble and wife, Garnet, of Maysville, her daughter, Katherine Tumey and husband, Billy, of Marion, OH, and her son, John P. Trimble of Vanceburg. She is also survived by her grandchildren, Shelby Scott Trimble and wife, Kristi, and Bryant Keith Trimble and wife, Jenni, both of Maysville, Kathy Jo Herr of Meeker, OH, Darrell Tumey and wife, Anna, of Canal Winchester, OH, and Danny Tumey and wife, Kathy of Prospect, OH; her great grandchildren, Matthew, Chan, and Lydia Trimble, Allison, Ian, and Kyle Tumey, and Ryan (Lindsay) and Derek Sanderson; her great, great grandchild, Ezekiel Sanderson; and her sister, Lula Mae Linville of Maysville, KY. In addition to her parents, Irene was preceded in death by her first husband, John Powell Trimble; her second husband, Tommy “Duck” Reeder; her sister, Gladys Shepherd; and her brother, Smith “Jack” Shepherd. Service will be 1 p.m., Tuesday, April 2, at Boone-Nickell Funeral Home with Pastor Kathy Herr and Bro. Dan Wylie officiating. Irene will be laid to rest in Wedonia Cemetery. Visitation will be 6 to 8 p.m., Monday, at the funeral home. To help offset funeral expenses, donations may be made to Boone-Nickell Funeral Home (150 West Water Street, Flemingsburg, KY 41041).